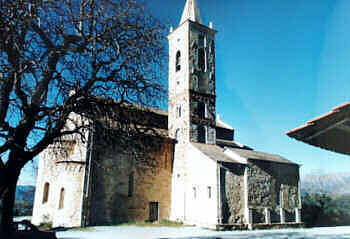 "Nostra Signora delle Grazie" Sanctuary (Fig. 1) is located in an outstanding position of Imperia (Italy) surroundings. This intact monumental area, built up at the end of 11th century, in the 1910 has been visited also by the president of USA F. Roosevelt during his pilgrimage in Italy. Columns and capitals are constituted by limestone voussoirs, on some of which superficial and crossing cracks are present, probably due to thrust and peak loads or because of non uniform distributions of stresses driven by overhanging elements. In order to investigate the state of conservation of columns and capitals, an ultrasonic survey has been carried out so to check cracks depth, pattern and length. This investigation turned out to be determinant for the performance of a complete anamnesis and diagnosis of the structural elements studied, allowing the identification of the damaged ones. Some of them have been consolidated by epoxy resin injections while some others were so damaged to be necessary their replacement with new pieces of the same stone. Both resin injections and replacement stones have been checked by ultrasonic methods. Ultrasonic non-destructive technique has been also applied to determine mono-axial compression strength and dynamic elastic modulus of the stone. The pieces that have been substituted, have been conserved to be exposed as memory of the sanctuary life. The results demonstrate the importance of this non-destructive method for anamnesis and diagnosis in the field of conservation. The knowledge of structural elements state of conservation and relative elastic characteristics are absolutely indispensable for any project of conservative restoration of a hand-made artistic structure which has a bearing function and is subjected to static and/or dynamic loads. Parameters such as ultrasonic propagation speed, wave attenuation, "in situ" mechanic strength and visual survey, are fundamental to understand the loading, weathering and time deterioration which have insisted on the material. The traditional methods used for the determination of these parameters are generally destructive, as they need the application of static loads on samples extracted directly from the structure. On the contrary, non-destructive methods, such as ultrasonic investigation, can be successfully used to assess the state of conservation of the architectural elements, with regard of monument integrity. This diagnosis work has been conducted with the purpose to determine the state of conservation and the residual strength of limestone voussoirs and capitals, using the ultrasound survey according to the traditional technique (UNI 9524) and to original methods. On most of the capitals it has been possible to observe the presence of clayey veining, weak spot of the structure, crossing cracks due to thrust and peak loads, local cracks due to the oxidation of iron wedges located in capital-column joints. The columns are constituted by compact limestone voussoirs, most of which show superficial cracks and bedding. These damages are due to a non-uniform distributions of stresses driven by overhanging elements. On that column where the worst deterioration is present (identified with n° 6), scaling and detachment plates are evident. 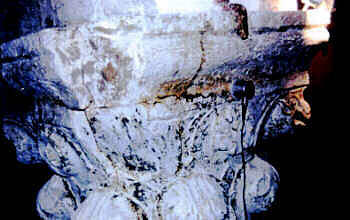 The capital and stone footing of the same column are deeply damaged. In particular on the stone footing, scaling and delamination processes developed because of the crystallisation of the salts brought by capillary rise humidity or present in the stone composition. Generally, the formation of salt crystals takes place with volume increasing which generates inner stresses similarly to what happens in the transformation water-ice. This phenomenon depends on the number of evaporation and saturation cycles which is linked with the stone porosity, the condition of water priming and superficial evaporation. As these damages have been always evident in the church, lots of footing stones, voussoirs and capitals have been replaced in the past without a preliminary diagnosis capable to determine the causes of the deterioration. Determination of the relative humidity "in situ"
The humidity content present near the columns has been indirectly determined by the measurement of the relative humidity. In this case, this investigation has been very helpful to survey the presence of capillary rise humidity, in the lower part of the columns, and of spreading and infiltration from the roof, in the upper part of them. In order to determine the presence of metallic elements hidden in the columns, a magnetometric investigation has been conducted. The localisation of these elements has been done by an induction magnetometer. This method consists in the determination of the stone surface hardness derivable from a parameter depending on the bounce rate of the sclerometer beating bulk. In general, for the tests done on the most common structural elements (beams, pillars, etc.) a sclerometer type N has been used (2.207 Nm impact energy). The sclerometric index is the conventional parameter calculated with a specific procedure which gives information on homogeneity and wearing resistance of the area under investigation. This method consists in propagating ultrasonic pulse signals, produced by a transmitter in contact with the surface of the material under investigation, and in measuring the delay with which, those signals, are collected by the receiver located at a certain distance from the transmitter. The measure determined is the propagation speed of the ultrasonic pulse in the path between the two sensors (UNI 9524/89). This velocity depends on the elastic characteristics of the material under investigation and can rapidly vary in presence of dishomogeneity (cracks, damaged areas, defects, etc.). This kind of survey can be used not only as a comparison method but also for the determination of the dynamic elastic modulus. The ultrasonic pulse recorded by the receiver probe, is transformed in an electrical signal suitably amplified, visualised on the oscilloscope screen and printed. The ultrasonic investigation results, with particular interest for the qualitative analysis of the signal received and the attenuation of the wave along its path, have been elaborated so to achieved important conclusions, essential for the successive quality control. Moreover, very interesting results have come from the precise evaluation of columns verticality so to assess load distribution. The high ultrasonic speed generally recorded on the voussoirs of this column, enhances the good compactness of the limestone. However, there are few directions which should be taken under control as the attenuation of the ultrasonic wave along them has been very high because of the veining and an inner crack. The current inclination of the column, which is 2 cm out of its vertical line, has been contributing to the cracks formation. On the capital, crossing cracks, surely formed during the past seismic events, were evident. For these reasons, it has been necessary to consolidate the column and the capital by appropriate epoxy resin injections suitable for the restoration of the material continuity. In the upper part of this column, microcracks and a flaking have been created by peak loads due to the absence of jointing mortar between voussoirs; so a consolidation intervention with epoxy resin injection has been necessary. Currently, the capital is reinforced with a metallic wrapping. On this column, a diagonal superficial fissure, inner microcracks and crossing cracks were present. Epoxy resin injections have been used for its consolidation. Most of the voussoirs of this column have been damaged by cracks probably due to peak and thrust loads. The capital was slivered, too. Plates near the detachment and microcracks were present all other the column. The microcracks on the voussoir located just under the capital were due to peak loads and seismic stressing. The capital was in good conditions. The non-destructive survey conducted has emphasised the severe decay and deterioration of this column. Important flanking and delamination were evident on the footing stone, surely due to the capillary rise which transports the sulphates from the soil. The sulphates, once in the stone, can participate to complex chemical reactions resulting in the formation of products with an increased volume. The volume change is the cause of extremely dangerous stresses inside the material which can bring to its destruction. The possible solutions were the complete substitution of the footing stone or a delicate work of "prosthesis" with an epoxy mortar and filler of the same stone. The two lower voussoirs have been substituted because of the severe damages (plate detachment and stone flaking) due to past earthquakes and scarce jointing mortar, cause of peak loads. The capital was in very bad conditions with such crossing cracks to require a special intervention (Fig. 3). After the diagnosis of the state of conservation of the structural elements it has been clear that most of them needed to be consolidated. The restoration techniques, materials and application system chosen, are approved by the document NORMAL N° 20/85 which is binding for the artistic and monumental restoration sector. In some areas the restoration project has focused on the re-establishment of the static functionality endangered by cracks and detachments, while in other structural elements the material cohesion has been improved so to limit time deterioration. Cracks have been restored with pure epoxy resin injections. The traditional injection at moderate pressure (1-3 atm) is applied for damages larger than 500mm. The number per linear meter of injectors is at least 3, increasing it for finer cracks. Before injection, the fissures are sealed in the outer part with epoxy plaster or similar material. An epoxy resin with low viscosity has to be used. The workability of this kind of material is inversely proportional to the room temperature. After finishing the work, the injectors have been removed and the surplus sealing material has been eliminated by a flat trowel. The prosthesis have been realised or by gluing the detached original or precast parts or by using epoxy mortar with stone filler (so to maintain a colour similar to the one of the original element). In the case of the column n°6 (Fig. 4), element particularly damaged, it has been necessary the application of stainless steel pins with improved adhesion (REVAL bars). The pin, shaped so to assure good adherence and, in the same time, to allow a possible removal without damaging too much the stone, is fixed using a structural adhesive (special epoxy product). Moreover, the resin exerts a protective function on the metal, avoiding the contact with water passed through stone porosity. In order to assure the complete filling of cracks, the ultrasonic survey has been carried out. In fact, from the comparison of the oscillograph obtained before and after the restore intervention, it is possible to appreciate all the improvements provided and also all the cavities which could have not been eliminated. In Fig. 5 and 6 are reported the oscillographs recorded on column n°6 in deteriorated and restore conditions. An evident improvement is observable comparing the two curves. In conclusion, the contemporaneous utilisation of different kind of techniques has allowed a real time monitoring of the restoration intervention assuring the good quality and the complete success of the entire operation. D. Almesberger, M. Toncic. Diagnosi delle colonne e dei capitelli del santuario di N. S. delle Grazie (IM) con strumentazione ultrasonica. Relazione Tecnica. D. Almesberger, R. Geometrante, A. Rizzo, P. uran. Ultrasonic testing method for the characterisation of Pietra d'Istria structural elements. "9th International Congress on deterioration and conservation of stone", Venezia 2000. J. Krautkramer, H. Krautkramer, 1983. 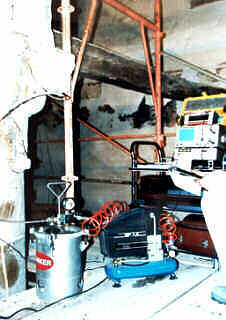 Ultrasonic testing of materials. Springer-Verlag Berlin Heidelberg New York. T. Bourbiè, O. Coussy, B. Zinszner, 1987. Acoustic of porous media. Editions Technip.